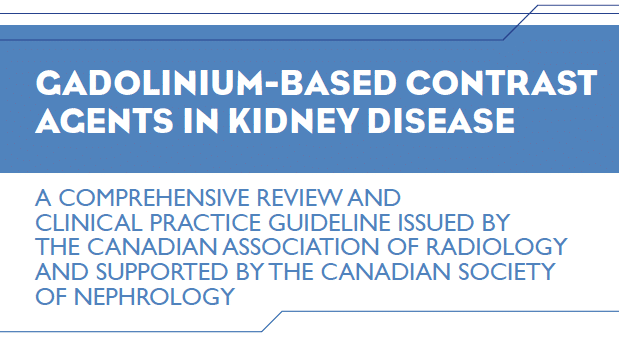 The CAR is pleased to announce the publication of Gadolinium-based contrast agents in kidney disease: A comprehensive review and clinical practice guideline issued by the Canadian Association of Radiology with the support of the Canadian Society of Nephrology. The guideline was written by an interdisciplinary working group of radiologists and nephrologists, chaired by Dr. Nick Schieda and Dr. Swapnil Hiremath. The guideline will be published in the Canadian Association of Radiologists Journal and the Canadian Journal of Kidney Health and Disease. The CAR would like to thank Drs. Schieda and Hiremath for their stellar work and their timely delivery of this guideline, which will be of great value to radiologists across Canada. In light of interest from our members and the medical community at large in practice issues related to the use and administration of Gadolinium-based contrast agents, the CAR is presently at work on a guideline regarding the issue of Gadolinium deposition on the brain. Additionally, the CAR is in the process of updating our existing Consensus Guideline for the Prevention of Contrast-Induced Nephropathy. Please stay tuned for more information about these guidelines and updates, and to provide your feedback during the member review process. In patients with acute kidney injury (AKI), chronic kidney disease (CKD) Stage 4 or 5 (estimated Glomerular Filtration Rate [eGFR] < 30 mL/min/1.73m2) or those on dialysis, macrocyclic or newer linear (gadobenate dimeglumine and gadoxetate disodium) Gadolinium based contrast agents (GBCA) can be administered when GBCA-enhanced MRI is considered necessary and no alternative test is available. Informed consent should be obtained in these at-risk populations, either verbally or using a written consent form, by a physician or their delegate (including MRI technologists) citing an exceedingly low (much less than 1%) chance of developing Nephrogenic Systemic Fibrosis (NSF) using macrocyclic and newer linear GBCA. Patients on dialysis should continue dialysis and hemodialysis should ideally be scheduled within 2-3 hours after GBCA administration. There is insufficient evidence to support initiating dialysis, switching from peritoneal to hemodialysis or altering dialysis regimes to further reduce the risk of NSF. Routine Nephrology consultations when GBCA is being considered in at-risk populations is not recommended. In the outpatient setting, for institutions using macrocyclic and newer linear GBCA, a modified version of the 6-question Choyke questionnaire is suggested to screen for renal disease at time of MRI scheduling only. The patient should be asked about a history of dialysis at time of MRI scheduling and MRI. Age is not considered a valuable metric to screen for renal disease. In the inpatient setting, patients should continue to be screened for potential AKI irrespective of their eGFR. For institutions using gadopentetate dimeglumine, gadodiamide and gadoversetamide, full screening should be performed at time of MRI scheduling and repeated again at time of MRI to maximize sensitivity for detection of renal disease. Gadopentetate dimeglumine, gadodiamide and gadoversetamide remain absolutely contraindicated in at-risk populations due to an estimated 3-7% risk of developing NSF (which may be an overestimate when standard dosing is not exceeded). Screening questionnaire to be administered to the outpatient population to identify renal disease at time of MRI scheduling (for institutions using macrocyclic agents and newer linear GBCA) and also immediately before MRI for institutions which use gadodiamide, gadopentetate dimeglumine and gadoversetamide. Pre-gadolinium screening questionnaire for identifying patients at risk of poor renal function, adapted from Choyke et al. (90). (a) Not included in the original Choyke survey but important to clarify prior to administration of GBCA. The panel suggests the question be asked to the patient at time of MRI scheduling and at time of MRI. Patients with acute kidney injury (AKI) or severe chronic kidney disease (CKD) and those patients on dialysis are at the highest risk of developing Nephrogenic Systemic Fibrosis (NSF). NSF is a disease which causes fibrosis (scarring) of the skin and internal organs similar to scleroderma. Patients with AKI, severe CKD and dialysis dependent patients who receive older Gadolinium (MRI Contrast) agents have about a 3-7% risk of developing NSF. Newer MRI contrast agents now exist, which are safer than older MRI contrast agents and are associated with a much lower risk of developing NSF. The risk of developing NSF associated with newer MRI contrast agents (consider discussing the type of agent used at a particular institution and the number of reported unconfounded cases with that particular agent) is exceedingly low. Although it is difficult to calculate the exact risk, it is probably much less than 1%. There is no evidence to support starting dialysis to reduce the risk of NSF. If you are already on dialysis, dialysis should be continued but there is no evidence to supporting switching the type of dialysis to further reduce the risk of NSF.